Welcome to the REBOOT REVIEW–the book review portion of Fiction Reboot | Daily Dose! Today’s review is of D.B. Jackson’s Thieftaker 4: Dead Man’s Reach. I had read good reviews of the previous Theiftaker novels, and was expecting a good read, but as all overly-prolific readers know, there is a big difference between a book you can finish in a week, and one you really loved and are going to recommend to your friends. For me, what tipped Dead Man’s Reach beyond the rank of “a good enough book” was the realism and unpredictability I found in the details of this historical fantasy novel. Yes that’s right—the apt detail work in a book about magic. (Or rather, conjuring—sorry Mr. Jackson.) One cannot describe the plot of this novel without copious uses of words like “magic” “witch” or “spells” but neither could one describe it without “Revolutionary War” “Boston Massacre” “winter” or “girlfriend.” It took witchcraft, historical knowledge, and believable characters to make Dead Man’s Reach the book it is. And to establish any of those elements, it took good writing and good detail work. For me, all of this was established and I was won over with one line on the first page. With the single line “Every breath produced a billow of vapor, rendering his concealment spell all but useless” the author told me much that I needed to know about this world: that magic exists, that it’s not perfect, that the protagonist can use it, that he is outside, and that it’s damn cold! On the first page this line convinced me that D.B. Jackson knew what he was talking about; he could integrate history, fantasy, and plot seamlessly throughout the novel, without forgetting the little details. These characters, the first page hinted, and the rest proved, would be human enough to identify with and squishy enough for their fights to be thrilling, and therefore unpredictable enough to be interesting. Of course Dead Man’s Reach’s details did more than recognize the misery of a northern winter, they built real characters and believable events. The protagonists’ romance was long-established when I first butted into it, and so it was not built on magic moments of chemistry or grandiose gestures of the early stages of a fictional romance, it lived on the small details of a couple who talk over their dinners, who have silent-treatment spats, and who need to report in once in a while when they are fighting evil wizards so the other person doesn’t worry. You know, normal couple stuff. The details of the world and its characters made the Theiftaker world believable and interesting. The structure of the adventure kept me reading at a pace which was really not good for my housework. The book follows Ethan Kaille and his friends (and his enemies) through the streets of pre-Revolutionary War Boston. While the street surfaces are flooded with lobsters, a much more insidious enemy lurks…somewhere in the city. And yet the Revolutionary War is much more than window dressing for Dead Man’s Reach. Jackson integrated details of the actual British occupation beautifully, showing how prevalent it was in every day of the characters’ lives, and making it an integral element of the plot. And well, really he had to. Can you imagine running through the crowded city cutting your arm and casting spells, trying to stop an invisible evil force without a few of the hundreds of soldiers at least noticing? And so it is with the tense and suspicious background that Ethan Kaille must face an invisible enemy intent on starting a war, destroying the city, and tearing Ethan Kaille apart personally. As an incurable ending-guesser I was pleasantly surprised to never know what was going to happen next. Throughout the entire adventure, as I followed the theiftaker and his friends through pre-revolutionary war Boston I was curious to find out what was going to happen, and afraid that each favorite character might be the next to go. I never knew what step Kaille was going to take next, what magic he would, or could, employ in his cause. I was genuinely worried throughout the book that he would get arrested for witchcraft and have to watch his nemesis take over from a barred window, or worse yet that he would get caught up in Adams’ cause and find himself trapped in a bloody confrontation between the revolutionaries and the British “lobsters.” I worried that Ethan’s friends would desert him when they found out he was different. I worried about a lot of other things too, and many of them came true, but I’m not going to be the one to tell you which—though I will mention that there is a rumor this will be the last book in the series. D.B. 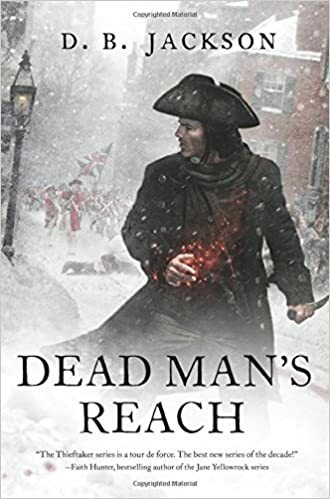 Jackson’s Dead Man’s Reach was a fun read start to finish with believability in its magic, accuracy in its history, and real suspense in its adventures. Dead Man’s Reach will be available on July 21st. Next PostNext Fiction Reboot Review: Brian Kirk’s WE ARE MONSTERS.